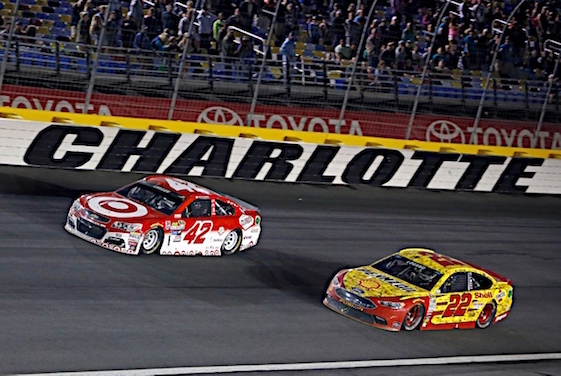 A strange format that included a winner’s purse of $1million left a lot of questions marks in the air as well as fireworks at the end of the three segments of the Sprint All-Star Race. Ultimately, the law of unintended consequences caught up with those who formatted the “unique” approach of the race, which includes officials of the track and sponsoring Sprint as well as NASCAR. In the end, one of the fastest cars won in the form of Joey Logano’s Ford, which carried an incredible display of photo silhouettes of 50 years of racing by his team owner Roger Penske. But this race would be difficult to sum up with a single snapshot. “All I knew was that if there was a car in front of me, I better pass it,” said Logano. If confusion trebles excitement, then the format left nothing on the table. Each 50-lap segment had a mandatory pit stop and the first one caught out the Joe Gibbs Racing team of Matt Kenseth, literally. Kenseth’s crew chief, Jason Ratcliff, left his driver out of the pits too long. Ratcliff had wanted to pit late in hopes of staying close to the front just as Penske teammates Logano and Brad Keselowski had done, plus JGR’s Kyle Busch and Carl Edwards. But a late caution meant closed pits and Kenseth, the only driver who had not pitted, became a lame duck leader at the end of 50 laps. Missing the mandatory stop left Kenseth in front of nine “lapped” cars. Since the segment had ended, after the Lucky Dog to Earnhardt, Jr., eight cars remained a lap down. And so was Kenseth, who was penalized a lap for not pitting. From then on, confusion took over, because none of this is how things usually work. Tony Stewart may be retiring, but he’s never shy and was aggressive as usual after getting caught in the night’s lone multi-car accident. One of those who had been “lapped,” Stewart opined that it was the craziest All-Star race he had ever participated in. “I’m glad this is the last one,” he said after a couple of hard licks during the melee that apparently posed no problems to his injured back. This was a theatre of the bizarre in living, high-speed color beyond the Kenseth affair. Chase Elliott, who was voted into the race by fans, tried to pit from the outside row on the first lap of green during the second segment – to satisfy the mandatory pit stop rule early – and caused “The Big One.” It collected Stewart and ruined Elliott’s own chances. It was a purpose-built strategy for this race only, which demonstrated once again that the teams backfired while using this new format, too. Meanwhile, contender Edwards got caught by the lug nut police during a mid-race check between segments, which normally doesn’t happen in a regular points race. Ever-quick Kyle Busch lost his chances for victory when he got caught the old-fashioned way for speeding entering the pit road after the opening segment. Ultimately, it was NASCAR that got caught out. Scott Miller, senior vice president for competition, met with the media after the rain-delayed race well past midnight and under a full moon. He said the sanctioning body was “disappointed” that it didn’t anticipate a scenario like the one that developed with Kenseth. “We didn’t have any procedure to deal with it,” he acknowledged. The idea of showcasing the pit crews and mixing up the strategy with mandatory stops might have backfired due to confusion. But as anticipated, the final 13-lap segment produced a classic finish, in part because of the artificial element of making some of the lead lap cars stay out of the pits and race to the finish on worn tires. Because of so many lapped cars following Kenseth-gate, only two cars were forced to stay out of the pits after a random drawing determined 11 lead lap cars had to pit. That was enough to set up a delicious duel between Kyle Larson and Logano, both on four fresh tires. Logano hunted down the younger driver – who appeared headed for his second victory aboard a Sprint Cup car in one day. “He took the air off of me a couple of times, which is cool, and he did a fabulous job of side-drafting me coming down the front straight,” said Larson. In the end, the Chevy owned by Chip Ganassi and Felix Sabates ended up in the wall due to Larson’s overexertion after getting passed with two laps to go by Logano. That advanced Keselowski to second. Earlier it was Larson, the kid who now sports a waifish beard, emerging victorious in a showdown with young counterpart Elliott in one of the afternoon’s qualifying races, postponed from Friday due to rain. With a chance for the winner to advance to the $1 million All-Star pay day, Larson and Elliott fought door-to-door with more contact than Ali and Frazier. Another overdue rising talent, Bayne, won a preliminary race with an optimistic move that looked very smart in retrospect. Forty-something veteran Greg Biffle, who has not seen a victory lane since the Dark Ages, i.e. the time before Roush Fenway Racing fell into a dark hole, was also a winner in the qualifying races. That gave Roush Fenway two exhibition wins in one day and the team’s first “wins” since 2014. But it was Penske Racing, arguably one of the smartest teams in racing, which scored a one-two knockout under a format that forced everybody to have a think about it. One could argue this event showcased young and old alike as well as the savviest. NASCAR’s Miller hinted that the format could be revisited next year with a tweak to avoid this year’s confusion. That’s a worthwhile consideration given the fact that by next year everybody – including the fans with little idea how their favorite drivers may have gotten a lap down – will be more familiar with a wacky but engaging and exciting format. Including the preliminary races, Saturday night was a case of all’s well that begins and ends well, despite a lot of confusion in the middle.